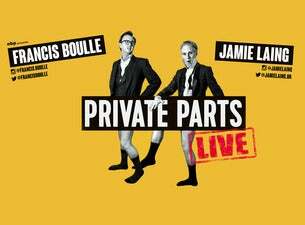 For the very first time TV stars Jamie Laing and Francis Boulle are coming to a theatre near you! The two loveable gents are treading the boards with their live, laugh-a-minute extravaganza developed from their hit podcast Private Parts. They have promised to share all the intimate and sordid details of their private lives, including gossip from both on and off the screen – so don’t miss out on a truly hilarious evening and an opportunity to meet them after the show too!